Peak Sports Press, 9780974625454, 281pp. Feed your adrenaline this winter with Monique Ryan’s latest nutritional guidebook. 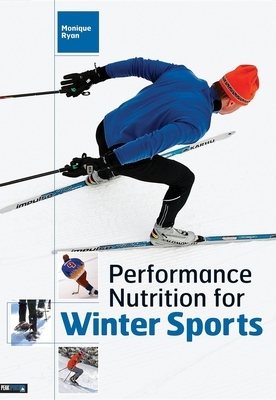 Performance Nutrition for Winter Sports provides the sport-specific nutritional advice that is essential for cross-country and alpine skiers, snowboarders, snowshoe enthusiasts, and hockey players. Winter sports athletes and enthusiasts will train smarter, recover faster, compete stronger, and maximize endurance with this nutritional guidebook in hand. Monique Ryan details the nutritional guidelines specific to each sport and outlines daily training diets that can be used to create full menu plans. Athletes will find countless menus and strategies for downhill and cross-country skiing, snowboarding, snowshoeing, and hockey. Key nutritional information is highlighted throughout: glycemic index of foods, facts about vitamins and minerals, comparison of sports nutrition products, and sample menus. Each sport places unique demands on the body, and these demands are further complicated by your agenda—recreation, training, competition, or recovery. Whether your sport entails quick bursts of energy, steady activity with periods of faster movement, or sheer stamina over a long period of time, the way that your body fuels the effort will be dramatically different. Monique Ryan, expert nutritionist and health writer, explains the science behind her targeted strategies and forks over a heaping plate of menus and nutritional information to help you find more enjoyment and improved performance on the slopes, in the hills, or on the ice. You don’t have to be competing at the highest levels to benefit from the extra boost that a conscientious diet can provide. And, if you are investing countless training hours in your sport to reach new performance goals, the food you choose will either fuel that ambition or cause you to bonk somewhere along the way. Monique Ryan, MS, RD, LDN, CSSN is an internationally recognized sports nutritionist with nearly 30 years of professional experience helping elite and age group endurance athletes and professional, major league sports teams to optimize their nutrition. She is founder of Chicago based Personal Nutrition Designs and the best selling author of "Sports Nutrition for Endurance Athletes," "Performance Nutrition for Winter Sports," "Performance Nutrition for Team Sports," and" Complete Guide to Sports Nutrition." Ryan has worked with USA Triathlon, USA Cycling, Synchro Swimming USA, the Timex Multisport Team, Chicago Fire MLS Soccer Team, and four professional cycling teams. She is a trusted source for nutrition stories in "New York Times," "Chicago Tribune," "Runner's World," "Fitness," "Men's Journal," "Men's Health," "Outside," and "Oxygen."